A water-based natural organic and vegan serum that immediately quenches thirsty, dehydrated skin to help protect it against environmental aggressors and pollutants. 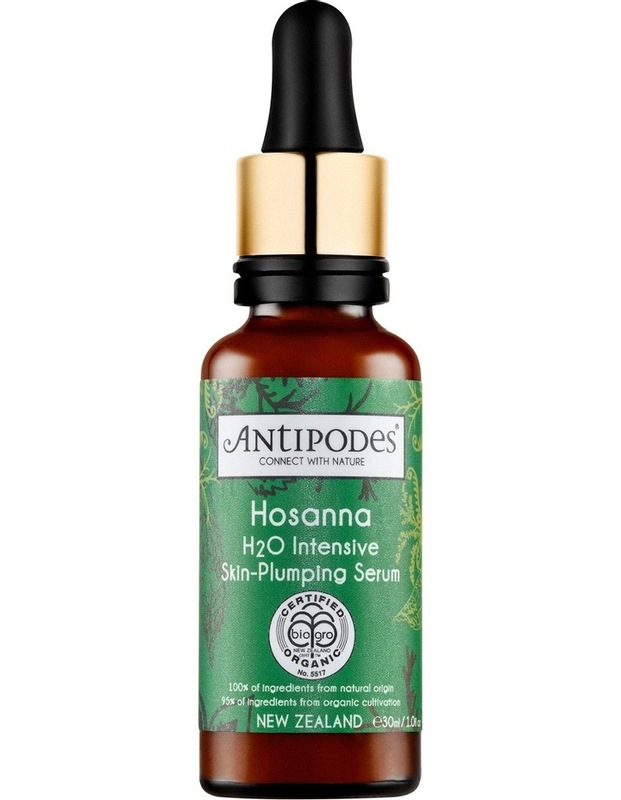 Hosanna H20 Intensive Skin-Plumping Serum is a water-based natural and organic vegan serum that will quench your skins thirst and plump up its contour. Hosanna features revolutionary antioxidant compound Vinanza Grape from Marlborough sauvignon blanc grapes which helps to keep skin cells super-hydrated and protected from the damage caused by environmental aggressors and pollutants. Extract of mamaku black fern helps foster cell renewal, making this an everyday essential item for plump, healthy, youthful skin, while 15,000-year-old Waiwera artesian water from deep within the New Zealand earth is rich in natural minerals. Hosanna has a pure plant fragrance of rose and cardamon and is perfect for most skin conditions, especially dehydrated. Scientifically shown to stimulate Type I collagen production in human fibroblast skin cells by up to 72%. Certified organic by BioGro with 100% of ingredients from natural origin and 95% of ingredients from organic cultivation. Certified vegan by the UK Vegetarian Society (VegSoc).